Madalene received a B.A. degree in Justice Studies from John Jay College of Criminal Justice and a J.D. from the Western Michigan University Thomas M. Cooley Law School. Ms. Sabino has also served as a judicial intern for the Hon. John T. Hecht of Kings County Criminal Court. Since being admitted, Ms. Sabino practices at the trial level of the New York State Supreme Court in its various counties representing clients injured in motor vehicle accidents, slip-and-fall accidents, construction accidents, and as a result of medical malpractice. She is also a member of the New York State Bar Association. Languages: Spanish. Madalene Sabino is a passionate and diligent attorney. Madalene makes daily appearances in courts throughout New York City to argue motions, attend conferences, conduct depositions, summary jury trials, and full fledged trials in Supreme Court. 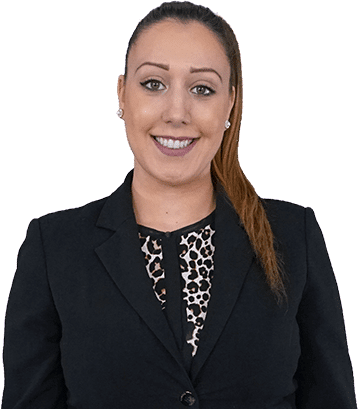 Madalene is a tenacious litigator who spends time going over all of the pertinent factual details of a client’s case in preparation for a deposition or trial. She is also very good at synthesizing and grasping complex legal issues to make winning arguments before a judge or jury. Prior to joining Frekhtman & Associates, Madalene served as a judicial intern for the Hon. John T. Hecht of Kings County Criminal Court. Since being admitted, Ms. Sabino practices at the trial level of the New York State Supreme Court in its various counties representing clients injured in motor vehicle accidents, truck accidents, ceiling collapses, slip, trip, and fall accidents, construction accidents, and as a result of medical malpractice. She is a member of the New York State Bar Association. Languages: Spanish.